Welcome to the Discussion Guide for the TD&H Section! New to GC, or just need a refresher on the workings of the TD&H section? This guide is here to help by answering FAQs and providing helpful tips for discussion. Should I classify my discussion as a theory, debate, or headcanon? Knowing what to label your discussion as is important! 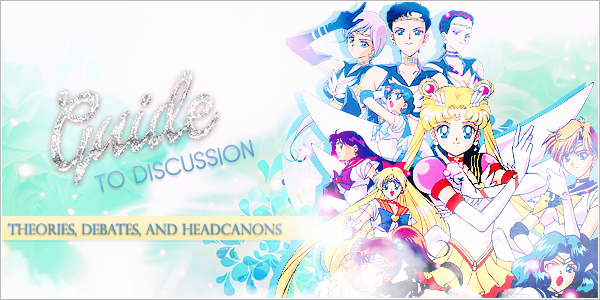 This is best summed up by Neo Queen Serenity's words in the Theories, Debates, and Headcanons Rules: "Basically, if you have a question and you want to hear other people's ideas along with your own, it's generally a theory. If you have a comparison between something or something you side with and want to make your point on, it's generally a debate." 1. Is it something I believe is true or want to see if others think so or not? A: If yes, then it's a debate. 2. Am I asking a question to figure something out and want to hear other ideas? A: If yes, it's probably a theory. 3. Am I comparing two things to one another? Such as UsaMamo and HaruMi: who is better? A: If yes, it's probably a debate. 5. Do I have an idea that I side with while I know others side with another popular idea instead? Want to make your point and one up the other in a friendly discussion? 6. Do I have a 'why' or 'why not' question? If your discussion doesn't seem like it completely fits the critiria for a theory or a debate, it may be a headcanon! What is the "Greatest Hits" series and how does it work? Periodically, the current moderator will choose an old, forgotten topic and repost it to spark new discussion! Whether your opinions on the topic have changed, or you weren't around to discuss it when it was originally posted, this is a new chance to tell others what you think! Check out the list of every Greatest Hits Thread here. I'm looking for an older thread, but I don't want to waste time looking through every page for it! What should I do? This is what the TD&H Section Index is for! Every theory, debate, or headcanon ever posted is organized alphabetically and by group for your convenience. Even if you're not looking for anything specific, you might find an thread in there you find really interesting! Consider what others have said before you post--the TD&H section was created to inspire discussion, and responding to what others have said instead of only posting your opinion makes every discussion a lot more interesting and insightful for you and others! Check out the Theories, Debates & Headcanons Rules, if you haven't already! Always be respectful, especially because other members may have differing opinions from yours. Remember, being respectful is one of GC's Rules! Remember to follow GC's Code of Conduct at all times (this applies to the rest of the forums as well!). It's great to have lots of ideas for topics to post, but make sure to not post them all at once so others have time to respond to each discussion. Check out the TD&H Section Index if you're ever looking for a specific topic or want to find interesting topics you might not have noticed!